The walls of City Lights are bursting with color, pattern, whimsy, joyful exuberance a bit of controlled chaos- counter balanced by deep thought. These works are a testament to the nature of the artist and her approach to living. We invite you to stand in the existential presence of Karen Loprete. 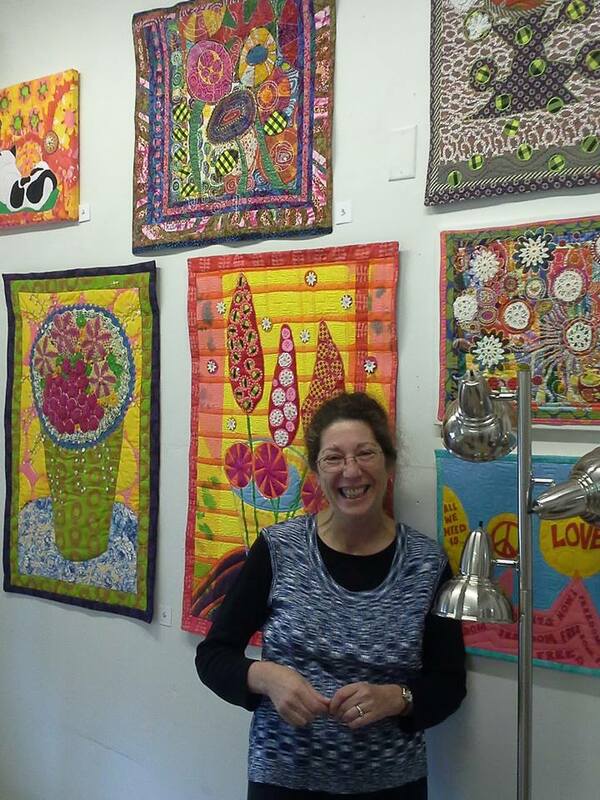 Be surrounded by her fabric artworks and soak in her vision and vitality and pass the positivity forward. Regretfully, the artist will not be present at the reception. She passed suddenly in August, leaving a void in the hearts of many. We will celebrate her life, her creativity, and her kind and happy spirit. City Lights thanks Karen’s devoted husband John Loprete and family, and close friend Kristina Blais for their generosity of time and act of love to assist with the production of this exhibit and celebrate an artful life, although too short, well lived.